La terre n'est pas une vallée de larmes | Earth is not a valley of tears. Swatch watch, 1989 with Surrealist Salvador Dalí design. This vintage Swatch "Croque Monsieur" came in yesterday. I have always loved Swatch watches because I find it humorous that they are plastic and Swiss made. It reminded me to remind everyone else to check out the Frida Kahlo show at The Dali in St. Petersburg. The show ends on April 17th. Jon told me to take advantage of the audio guide which is complimentary and so my friend and I took our time at the exhibit. It was small and incredibly intimate and this quality made it exceptional to me. Famous pairing. 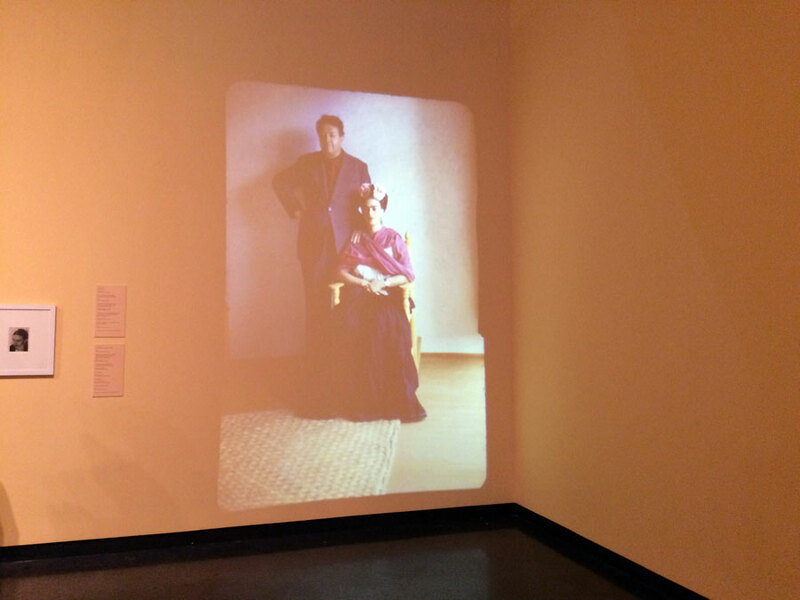 A projection of Diego Rivera and Frida Kahlo at one of the most intimate and heartbreaking shows I have even been to. Wishful thinking. Juli and other visitors add wishes to the ficus tree outside the museum. Streaming band width. Close-up. My own personal Swatch watch from 2009 and my Timex. Both from you-know-where. The Dali Wish Tree. (left to right) 1. My wish: To let my friends know how much I <3 them. 2. Me under a canopy of wishes. The tree had such good vibes. I loved it there. 3. I love that this beautiful installation is made of the ribbon that we are so quick to tear off of our wrist and quickly discard. It is a perfect example that something so small and ephemeral like a wristband and a wish or desire can make something so beautiful. Casa Azul. This is Frida in her garden outside the walls of the house in which she was born and passed away in. It is one of my favorite pictures at the show because it features: "her hairless dog Xolo in a jacket at her feet". This upcoming weekend is also our Eggstravaganza Easter Weekend filled with prize-stuffed eggs. Stop by on Friday and Saturday and break open some eggs with us :) We will be closed on Easter Sunday.